The Leatherman Raptor shears features the necessary tools for uniformed medical professionals to safely and quickly go to work in an emergency situation. 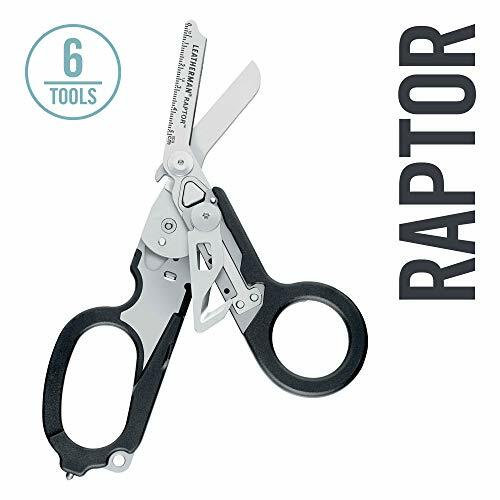 Developed with the input of special operations medics, EMTs and fire professionals familiar with standard medical shears, the Raptor was crafted with just the right balance of multipurpose features for medical-specific ops without an overkill of tools to complicate sometimes life-threatening situations. When it's a question of survival, the Raptor answers loud and clear. Closed Length: 5 in (12.7 cm); Weight: 5.8 oz (164 g); Shear Length: 1.9 in (4.8 cm). READY FOR ANYTHING: The Raptor features the necessary tools for medical professionals to handle emergency situations. When it's a question of survival, the Raptor answers loud and clear. FIT MORE FUNCTIONALITY: The Raptor is equipped with 6 tools, including folding medical shears, a strap cutter, a ring cutter, a ruler, an oxygen tank wrench, and a carbide glass breaker. SIMPLE AND SECURE: The specially-designed sheath allows you to carry your Raptor open or closed so you're always prepared. Choose between belt-friendly utility or MOLLE-compatible styles. ALWAYS ON HAND: No belt on your scrubs? The pocket clip ensures it'll never leave your side. Alternatively, attach your Raptor with the integrated lanyard hole.